Depending on how a home or business is structured in accordance to its landscaping, some homes or businesses benefit from retaining walls. A retaining wall is a structure that holds soil behind it. Sometimes these walls are used when a structure is set on a hill. Sometimes they are used to set off a garden area. There are various methods for retaining walls, and there is more than just one type of retaining wall. Depending on the look of the home or business, a necessary wall can be made out of brick, stone, wood or concrete, for examples. In the 21st century, a landscape designer has many more choices when creating the perfect retaining wall for a home or business. For example, there are wider options available for concrete walls and stone walls. 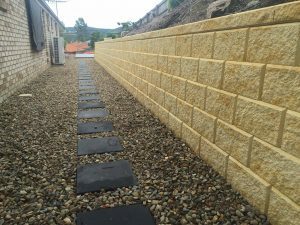 When choosing the perfect retaining wall for a home or business, what are the best available retaining wall options to think about for aesthetic, longevity and financial considerations.? Brick retaining walls are easily recognizable. They are some of the most popular walls seen in not only residences but also commercial properties. They offer an attractive look, particularly for brick homes and businesses as well as vintage properties. There’s more that goes into building a brick retaining wall then just stacking bricks. In fact, there are two major kinds of walls of this type, cavity and block core. The cavity wall is made of two brick walls that are only inches apart. These walls are the same width and the same height. Between the walls is not only steel but grout or concrete to complete the structure. Because these walls have bricks on both the front and the back, the costs of these walls are more expensive than the block core variety. In other words, more bricks are needed for this kind of wall than block core walls. The block core walls are more affordable than the cavity walls. This kind of wall is made of concrete masonry units or CMUs. A CMU is a block used for construction. They are a significant contribution to the building construction process and make the process more user-friendly. The CMU holds the steel and the concrete, and then the brick veneer is laid over it, thereby requiring less brick. The walls are just as durable and attractive as the cavity wall variety and are virtually indistinguishable. Block core walls can be made with a wide range of brick veneers in various colors to match a home or business. Stone veneer retaining walls may look easy to do, but they need to be constructed properly to ensure that the walls are functional and long-lasting. One of the best points about the stone veneer variety are what seem like the endless possibilities for the physical look of the walls. You can find many designs that make it almost certain that your wall will match your home or business. But why is the skill in the construction so important? The one thing that can destroy a retaining wall is moisture. Improperly construct a wall allowing moisture to take over, and you can have structural damage as well as land erosion that can cost you hundreds if not thousands of dollars. Therefore, it is recommended that only a skilled professional construct stone veneer walls. Once a landscape professional is secured, you will find that the veneer over the CMU block is there for not only the look and the design, but it is an excellent way to dress up an ugly wall or to give a home or business an updated look to increase its value. The most basic of the retaining walls is the concrete block. These were some of the first retaining walls constructed before the advances in retaining wall technology. However, because of its reliability, it is one of the best available retaining wall options. There’s never any risk of being unable to find materials for this kind of wall. The materials are available at almost every home improvement and building supply store, and it is easy to work with. Concrete masonry units of today also can look attractive for your home. No longer is a home or building owner stuck with only the old-fashioned cinder blocks of yesteryear or those seen in commercial properties. The standard concrete blocks are filled with concrete, and a reinforcing bar is used. These walls, however, are not particularly attractive and are not typically seen for residential properties. Therefore, unless they are being used for an industrial purpose or something not aesthetically needed, these blocks should be covered with a veneer for decoration. Veneers are widely available and come in a wide variety of designs. The split face block, on the other hand, has a decorative texture on one side, making a veneer unnecessary. You can also get a split face block in a color other than gray, such as in something resembling brick. Your landscape professional can help you choose the right concrete block for your home or business. Poured concrete is another known retaining wall option. It is the simplest of looks and colors and if used in the right setting is one of the best available retaining wall choices. A wall made of poured concrete resembles a slab of concrete in various forms. For example, you may find a poured concrete wall that rounds a corner, such as along a sidewalk or a driveway. One of the most popular places to see these kinds of walls are along freeways. Large poured concrete walls are used to separate the hills and residential property from the highway below. However, industrial and commercial purposes are not the only places to see these kinds of walls. A poured concrete wall can be utilized for an ultra modern home or business or in states where the look is popular, such as in New Mexico or California. There is a risk of the concrete cracking and breaking in a poured concrete wall. Therefore, you are more likely to see this kind of wall in an industrial setting where the cost of replacement is appropriate. The use of a professional landscape architect and a professional installer is even more important with a poured concrete wall due to its challenges. Another basic retaining wall that many people are familiar with are the wood walls. Wood retaining walls give a unique look that is perfect for homes and businesses, particularly if they are set in woodsy areas. However, wood retaining walls have also been known to be found in urban areas or other areas that don’t have to do with wood and trees. One of the best facts about this kind of wall is that they can be stained to match the wood of a residence or home, making them a perfect look. Wood retaining walls are some of the most affordable, especially for homeowners on a budget. However, these walls are usually more than just wood. They are typically reinforced with steel rods. A business or homeowner should keep in mind, however, that because wood walls are subject to moisture and rotting, they do not have the same lifespan as other walls. This is why wood walls are more affordable than the concrete, brick or stone variety. It is important to hire a landscaper who understands the vulnerability of wood walls and how best to keep them lasting longest. Another of the best available retaining wall options are rock retaining walls. 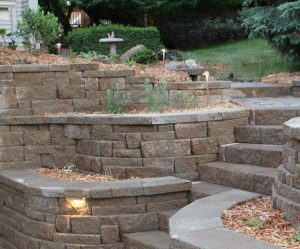 Of all the various retaining wall choices, the rock walls are the ones that have been around for thousands and thousands of years. The way to set these stones together is called dry walling. Professionals who know how to accomplish this technique can do it without allowing moisture to seep into the core, thereby ruining the wall. However, finding someone who knows how to dry wall can be tricky.. Therefore, a stone wall is more expensive than any other retaining wall due to the skill involved in setting the wall up. A way to mimic this ancient technique while still getting the look is to stack stones against a concrete core. The core cannot be seen, making it look like the wall has been created with dry walling. However, even if you use a concrete core you will likely pay more for this kind of wall than the other varieties. 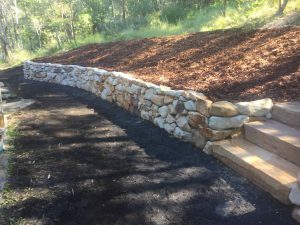 The most unique kind of retaining wall that you can structure is the gabion retaining wall. These are walls constructed with natural stone and held together with wire or wire mesh. Therefore, constructing this kind of wall does not require the skill of a rock wall. These walls are considered the most unique and were originally used for other purposes such as waterways. You typically see these kinds of retaining walls at coastal businesses or riverside homes. Therefore, this kind of wall is good for any structure that’s near a body of water. For people interested in being environmentally sound, recycled concrete can be used for gabion walls as opposed to rocks. One of the disadvantages, however, to these kinds of walls is the rusting of the wire mesh. No matter what kind of retaining wall you choose, it’s always important to work with a professional landscaper who can help you find the kind of wall that will work best for your residence or commercial property. The best available retaining wall options will only work if you focus on what will not only look best with the property but on what will function best. If you are looking for a long-lasting wall that will not require much maintenance, a concrete wall with a veneer is a good choice. If you’re looking for a very traditional look and you have the funds to construct it, a rock wall is extremely attractive and long-lasting. 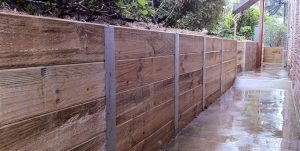 For those who have homes or businesses set in woodsy areas, a wood retaining wall may give you a look you desire. Homes or businesses set near the water can take advantage of the highly unique but structurally sound gabion walls.